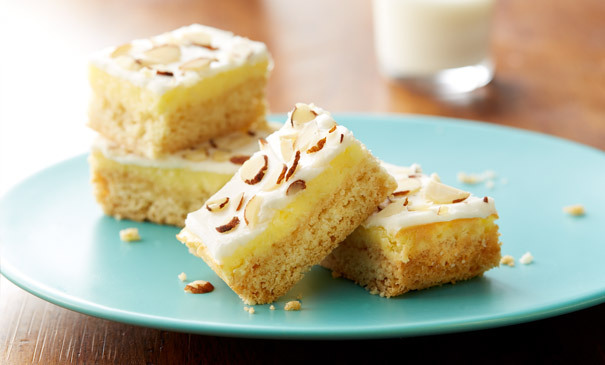 These fluffy bars are refined enough for a high tea and crowd-pleasing enough for an after-school playdate. They’re kind of like the little black dress of baked treats. In medium bowl, stir Crust ingredients until soft dough forms. Press mixture evenly in bottom of pan. Bake 15 minutes. Meanwhile, in large bowl, beat cream cheese and cane sugar with electric mixer on medium speed until smooth. Add 1 teaspoon almond extract and 3 eggs; beat 2 minutes, scraping side of bowl halfway through beating. Pour over partially baked crust. In small bowl, beat all Frosting ingredients except almonds with electric mixer on medium speed until smooth. Carefully spread over filling. Sprinkle with almonds. Refrigerate about 2 hours or until chilled. Store covered in refrigerator. The secret for cutting bars easily is to line the pan with heavy-duty foil. When it is time to cut the bars, just lift the baked bars with the foil out of the pan, and cut. Cheesecake bars cut best straight from the refrigerator. Use a wet sharp knife, wiping off crumbs after each cut.